Helen Spring, London Wildlife Trust. 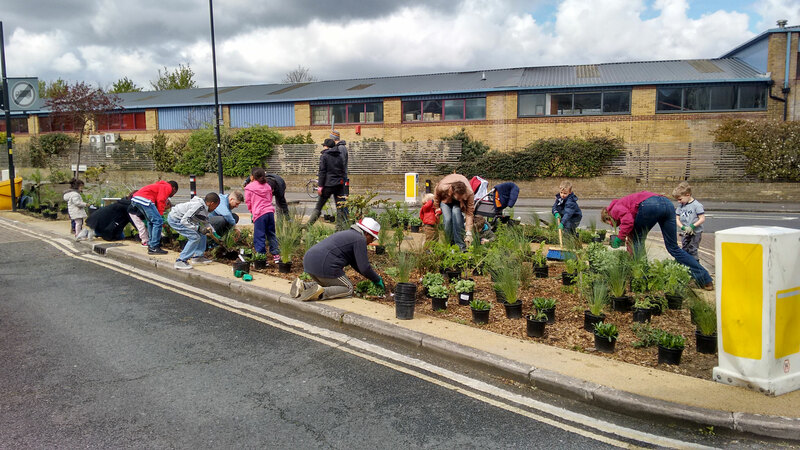 Through coordinating the Lost Effra Project, a south London based initiative with community involvement in creating SuDS at its heart, it is easy for me to see the many benefits that involving local people in creating grassroots SuDS can bring. Through working in close partnerships with local residents, community groups and schools, you can make more from a project in three key ways. By nature, no single measure can deliver all of the benefits that SuDS boast for a whole area. In order for SuDS to deliver all of their potential gains in terms of flood alleviation, water quality improvement, biodiversity and amenity value, they need to be rolled out on a much wider and more incremental scale than is possible for local authorities and developers to deliver. In order to get to the point where SuDS are on every street corner, every rooftop and every school playground, it is essential that communities are motivated and equipped to get out and create their own SuDS. By involving communities in the practical delivery of SuDS in public realm and shared spaces, whether that is through community planting days, resident led design or by attending a group build session, people will start to appreciate the need for SuDS, the benefits that they bring and can start to go about creating their own grassroots schemes. 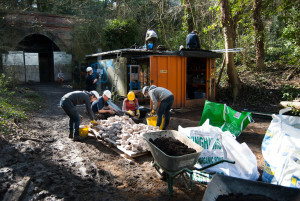 Like it or not, we are working at a time and in an environment where it is very difficult to get long term funding for maintenance, especially as an NGO relying on grant funding and working with increasingly stretched local authorities. By involving communities to take on the responsibility for the ongoing upkeep of the garden or green roof, you can keep the costs limited to the capital funding that you need for practical delivery with a small amount for training local people to maintain their scheme. As you are no longer relying on overstretched maintenance budgets, carried out by busy contractors, but by training local people to look after the gardens, you can create more interesting, colourful, eye catching spaces. In fact doing so will make people more motivated to look after them so you’re better off creating more exciting gardens and making them great for wildlife too – everybody wins. However, meaningful community involvement is inevitably going to add time to a project and is likely to pose more challenges than going it alone. The following lessons that we have learnt through delivering community SuDS should help smooth the process of community partnership and unlock the benefits that they can bring. Listen to local priorities for their spaces and combine plans to solve ongoing issues such as fly tipping, illegal parking or antisocial behaviour in dense housing areas. By solving an existing problem by creating a SuDS feature you will already be well on the way to gathering community support. Get people involved from the start, as this will help to encourage community ownership. If people have been involved in its creation, they are more likely to care about what happens to it. This might be through children watching the flowers that they planted grow over the following months and years, or picking up litter on their way past in the morning to make sure the area looks its best. Be flexible – it might be that you can’t take on every project. If you are approaching residents with an idea for their outdoor space, it may clash with their views or existing use of the area. Not everyone is a gardener – and some people want to keep it that way. You can’t force people to be involved so if they don’t want to take part in upkeep and there aren’t other local residents who want to step in then it might not be worth taking the project forward. Before we progress a scheme beyond the concept stage, extensive community consultation is carried out to make sure that there is strong community support for the scheme and a willingness to take on ongoing maintenance. Designing out demanding upkeep as much as possible helps to ensure that the SuDS measure will be successful in the long term. Although no garden is maintenance free, by sticking to perennials, dwarf shrubs and hardy species, as well as mulching to help stop weeds from dominating you can help to keep the need for maintenance down. Putting backup support in place for residents for once you have moved on is another way to help ensure a project’s long term success. This could be through involving local community groups to mobilise people for occasional community maintenance days, linking up residents involved in SuDS projects across an area for advice or arranging occasional corporate volunteer days if there is maintenance that isn’t being carried out by residents. By creating SuDS around where people live and work, you have the potential to improve their wellbeing, improve their access to nature and bring people together that might be living in an isolated way. The potential benefits are immense – and well worth the extra time and effort. Helen Spring is Coordinator of the Lost Effra Project for London Wildlife Trust. By working in close partnerships with communities to create wildlife rich SuDS along the catchment of the ‘lost’ River Effra in Lambeth, the project aims to increase resilience to climate change whilst improving the area for people and wildlife.